Crown-of-thorns starfish (COTS) (Acanthaster planci) are a naturally occurring corallivore (i.e., they eat coral polyps) on coral reefs. Covered in long poisonous spines, they range in color from purplish blue to reddish-gray to green. They are generally 25-35 cm in diameter, although they can be as large as 80 cm. Crown-of-thorns starfish are found throughout the Indo-Pacific region, occurring from the Red Sea and coast of East Africa, across the Pacific and Indian Oceans, to the west coast of Central America. 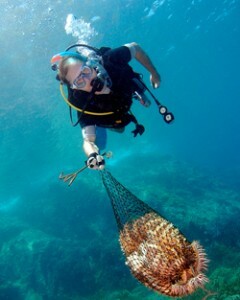 Predators of COTS include the giant triton snail (Charonia tritonis), the stars and stripes pufferfish (Arothron hispidus), the titan triggerfish (Balistoides viridescens), and the humphead maori wrasse (Cheilinus undulates). Crown-of-thorns starfish prey on nearly all corals, and their feeding preferences and behavior patterns vary with population density, water motion, and species composition. ref COTS typically prefer to feed on branching and table corals (e.g., Acropora), which are the same genera that are most vulnerable to bleaching. However, when branching coral cover is low due to overabundance of COTS or environmental conditions, COTS may eat other corals such as Porites or foliose corals (e.g. Montipora). 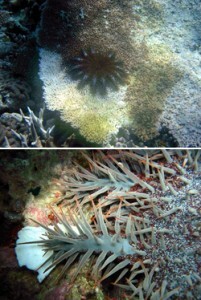 In addition to hard corals, COTS may also eat sponges, soft corals, algae, and encrusting organisms.